While studying at the Academy in Copenhagen and during the following years training at Munich, Meyer wanted to be a historical painter. 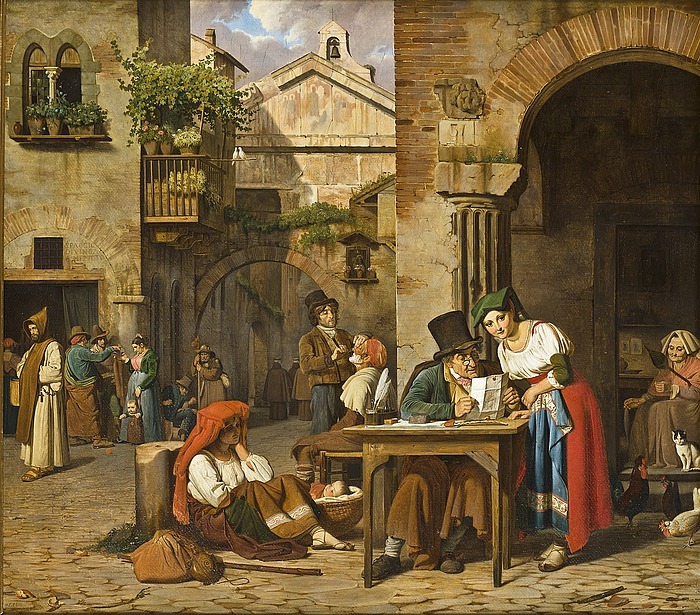 But when he came to Rome in 1824 he successfully turned to depictions of Italian street life. Today, we might see this type of painting as idealised and devoid of any social message, but the public of the day appreciated the humour with which Meyer was able to portray amusing everyday events. The scene here is played out on a Roman market place that no longer exists, the Piazza Montanara. The church in the background is S. Angelo in Pescheria. The girl is illiterate and must therefore make use of the scribe, who offers his writing and reading skills on the streets. She has received a letter and is eager to know its contents. Perhaps she has received a letter from her lover. At all events, her eyes are sparkling. In the companion piece, A Roman Street Scribe Writing a Letter for a Young Girl, Meyer has added his own name in a girl’s letter. So we could perhaps be led to believe that what is being read out here is the painter’s reply. She is looking toward us – and towards him.